Fashions in apps change. When Apple introduced third-party on-screen keyboard apps back in iOS 8, they were mostly productivity enhancements. Hopeful developers put tons of swiping keyboards, fast thumb-typing keyboards, and handwriting recognition keyboards on the App Store. I bought a lot of them. 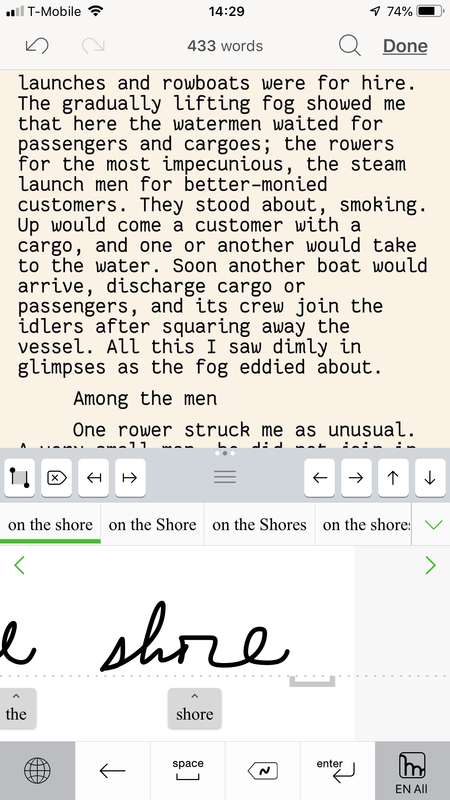 What I wanted was—and is—a way to use handwriting as input for iOS Scrivener. First, please understand that all third-party soft keyboards labour under multiple handicaps, since Apple does not permit them to access dictation or some other Apple-provided keyboard features. Further, in order to access their own internal preferences and build custom dictionaries, these keyboards must request full security access. If this freaks you out, these keyboards aren’t for you. In addition, handwriting recognition as an input method for English has problems. It’s not as fast as hardware typing by a factor of at least two. By using a swiping keyboard (SwiftKey is still available and maintained, if you’re interested) you can get much faster on-screen input as well. I consider handwriting input as special-purpose only. I use it for getting myself started when I’m fighting “writer’s block.” As soon as words are flowing, I switch to something faster. Recognition of my crummy cursive handwriting is the best of any these keyboards I’ve tried, including the late and much-lamented MyScript Stylus. I could get decent recognition from the PhatWare products (Penquills and Write Pad for iPad) by carefully informing the apps of which strokes I used to form each letter—but with Mazec this is unnecessary. On the other hand, Mazec is difficult about non-dictionary words. It just doesn’t seem to add new words without a lot of repetitions in block letters. There’s no way to manually add new dictionary words, either. But after a while it does seem to learn. Punctuation is a problem with these keyboards, and Mazec is no exception. Hashtags, quotes, bullets, underscores—expect to go back through and correct punctuation with the default Apple keyboard or a hardware keyboard. Setup is minimal. There are no themes and few options. Fortunately it works well as installed. But if you insist on dark mode, it doesn’t exist. All the other handwriting keyboards I’ve used have some means to allow continuous writing. Either they automatically insert after a short delay, or you can insert the recognition buffer by going back and writing over its start. Not so with Mazec. You must tap the insert button occasionally. It’s a mild irritation for me and an impediment to my workflow, but not so very bad as handwriting input is slow anyway. Editing is not as nice as MyScript Stylus. There are no editing gestures. The delete button will let you erase the last gesture, the last word or the whole recognition buffer. One thing that is nice is the built-in cursor move arrows—which make editing practical, if not fun. Mazec is about equal to the PhatWare products in ease of editing. If I had to start with a handwriting input keyboard now, Mazec is perfectly serviceable. But I’m going to keep using MyScript Stylus and the PhatWare keyboards as long as they still work.